Students at the Upper School have a wide range of opportunities to worship, study, serve, and grow in their faith. We have a robust campus ministry team made up of lay people and priests dedicated to seeing students grow in their faith and in their love of God and other people. Together with administrators, teachers, and parents, the campus ministry team seeks to guide students in the practice and exploration of their faith. The foundation of faith at the Upper School is its routine of daily prayer. The campus pauses for prayer at the start of its day, at midday, and at the close of the school day. Each class period begins with prayer. There are numerous prayer services throughout the year, like our Lenten penance services and first Friday Eucharistic Adoration. The cornerstone of faith at the Upper School is our weekly Mass, where the campus assembles together to worship and celebrate the Eucharistic mystery. 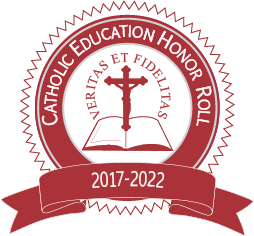 Many Catholic schools assemble less frequently, once a semester or once a month. A weekly celebration, though, helps center us and strengthen us as a community of faith, and has been a part of our faith life since the early days of the school. As an academic institution committed to a rigorous curriculum, the mortar of faith at the Upper School is our theology classes. Students are required to take a theology class every year at the Upper School. Courses include studies in church doctrine, Sacred Scripture, morality and justice, and philosophy, and emphasize the analysis of primary sources as well as providing formation opportunities for students in conjunction with their studies. The many and various apostolates at the Upper School are the windows of its faith, looking out from ourselves to a world in need. The apostolates at the Upper School are centered around putting our faith into action, following the example of Christ himself who came not to be served, but to serve. Offering regular meetings and prjoects throughout the year, our current apostolates take further inspiration from the spiritual and corporal works of mercy: feeding the hungry, visiting the sick and lonely, and praying for others and workng to uphold the dignity of every human life. Other service projects are offered by Campus Ministry throughout the year. A prime moment to experience and deepen one's faith is our annual retreats. Arranged by grade, these off-campus retreats begin the school year with a marked moment to deepen one's relationship with God and with one's peers.